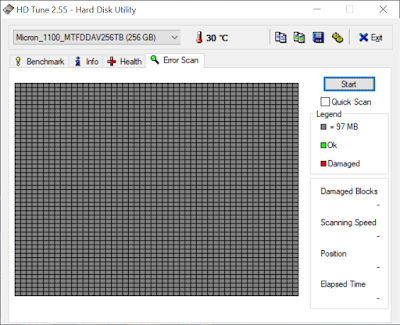 Although you can use Windows utilities such as scandisk, chkdsk or error checking (depending on which version of Windows you have) I have found a program called HD Tune to be the most reliable and informative utility to use. There is a Pro (paid for) version and a free version. Needless to say, I'm using the free version! Simply select your HDD from the dropdown menu, click on the Error Scan tab and then click on Start. Copyright (C) 2018 www.retrocomputing.co.uk . Awesome Inc. theme. Powered by Blogger.